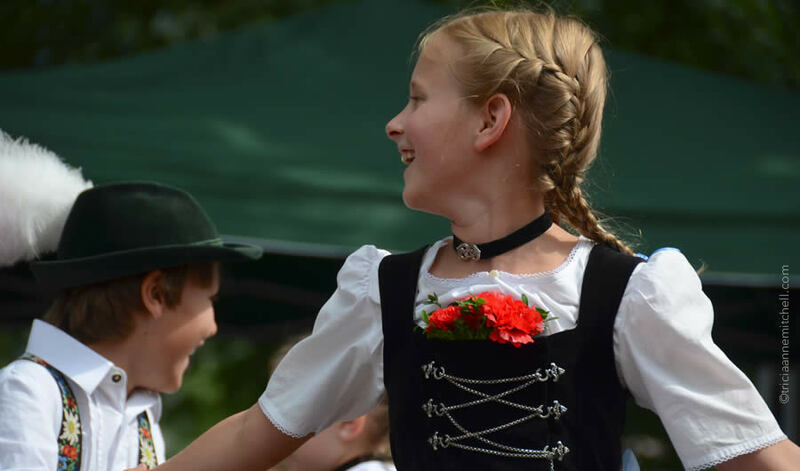 Over one hundred years ago, folk clubs in Germany, called Vereine, were established to help preserve fading aspects of culture, such as singing, dancing, and traditional music performance. 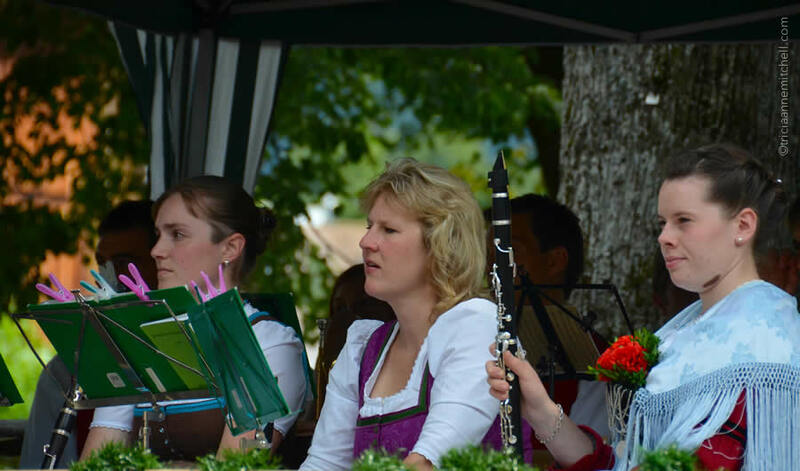 Several of my parents’ neighbors are even Verein members, and so we’ll sometimes see a middle-aged father, and his teenage son – dressed in Lederhosen (leather shorts and suspenders), woolen jackets, even a feather-adorned hat – hopping in their car with instrument cases in hand to attend weekly music practice. Horse-blessing ceremonies and May Pole celebrations are also held in neighboring villages. 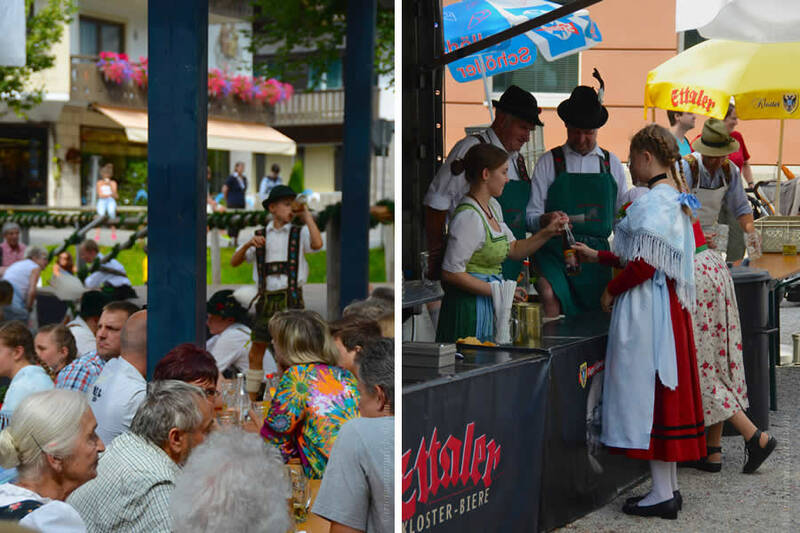 Each summer, Oberammergau’s folk club holds Gartenfests (garden festivals – as you probably guessed) replete with dancing, polka performances, and stands selling homemade cakes, fresh pretzels, Bratwürste, and of course, beer. If the vignettes I’ve described bring to mind scenes from the 1980s classic film European Vacation (when actor Chevy Chase hops on stage to have some knee-slapping fun with German dancers), perhaps that’s a fitting comparison. 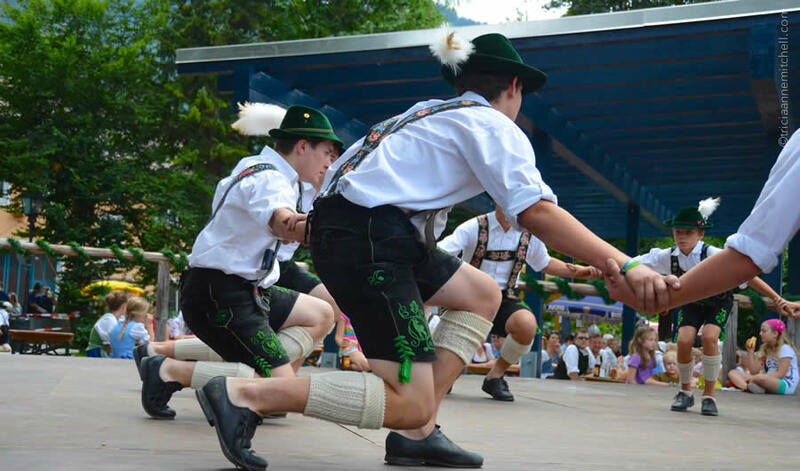 Indeed, Oberammergau’s well-coordinated male dancers also do the Schuhplattler, slapping their knees, thighs and soles of their feet, throwing in occasional hops. Now that’s a good way to burn off all that fest food! 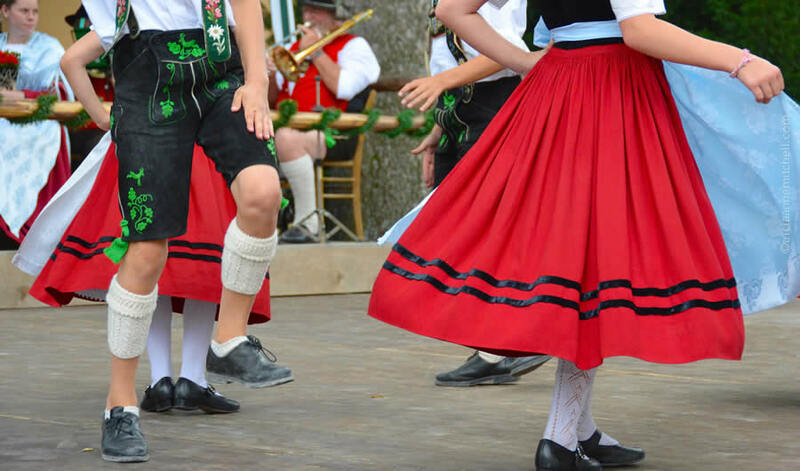 :) It is said that the Schuhplattler was originally performed so that young men could impress single young ladies, a courtship dance of sorts. 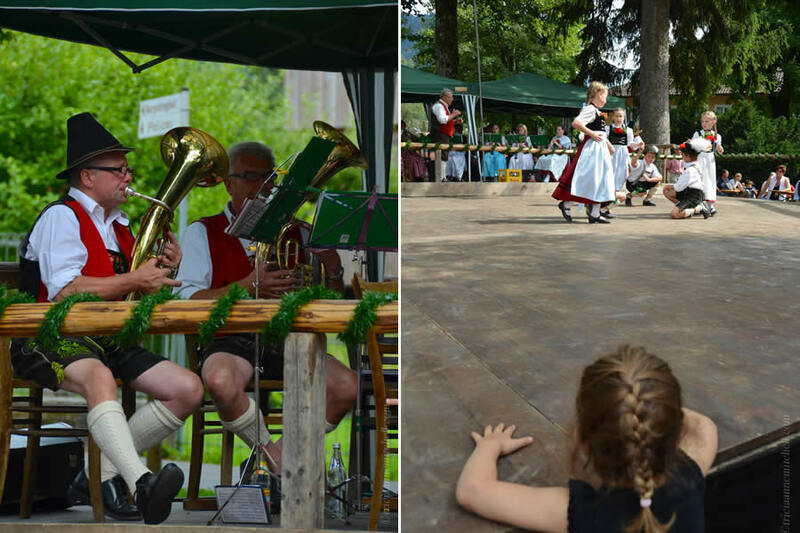 To get you in the mood for summer festivals, which are just around the corner, here are some vignettes from one of Oberammergau’s past Gartenfests. 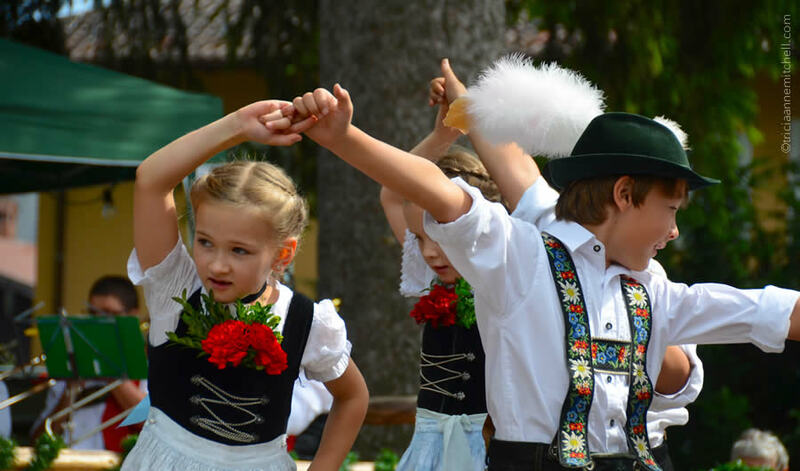 A young dancing pair, dressed in Tracht (traditional folk costumes) perform in the German village of Oberammergau. Dress such as this was commonly worn in Bavaria and neighboring parts of Austria until the late 19th Century. Folk clubs, known as Vereine, were eventually formed to help preserve aspects of culture such as dancing and singing. 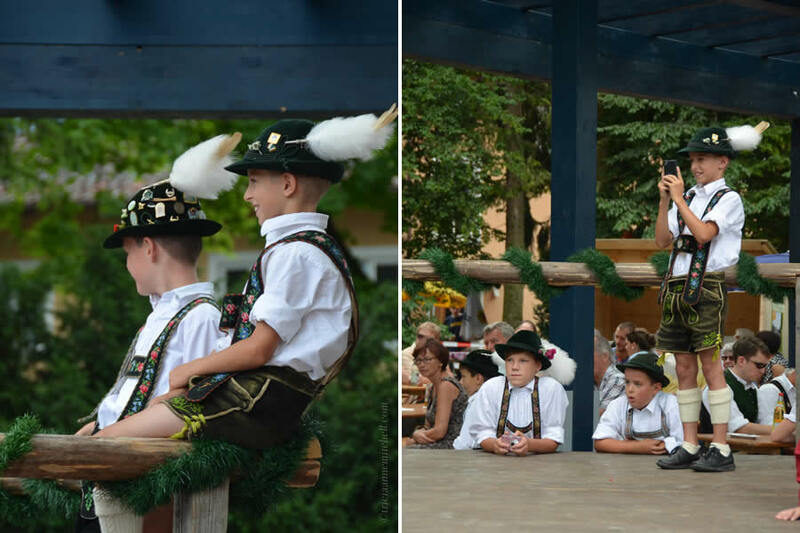 This particular performance was put on by a local Verein. The types of clothing vary, based upon the region. 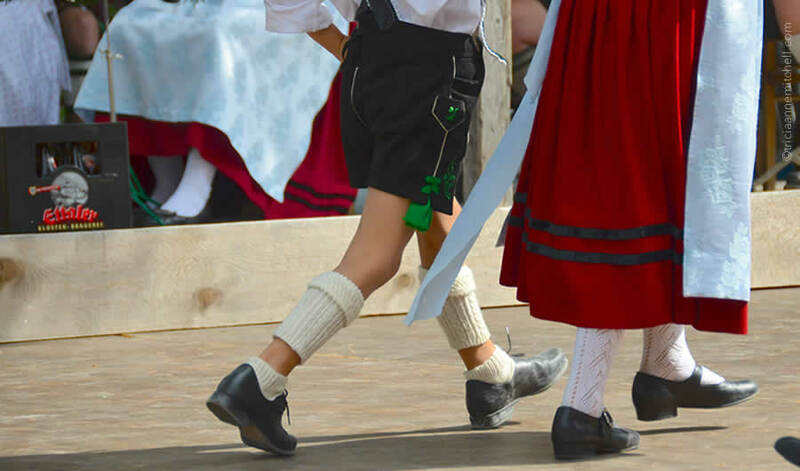 It’s all in the details: the boys and men sport Lederhosen (leather shorts) and hand-knit half-socks, and the female dancers wear white, lace-like stockings. 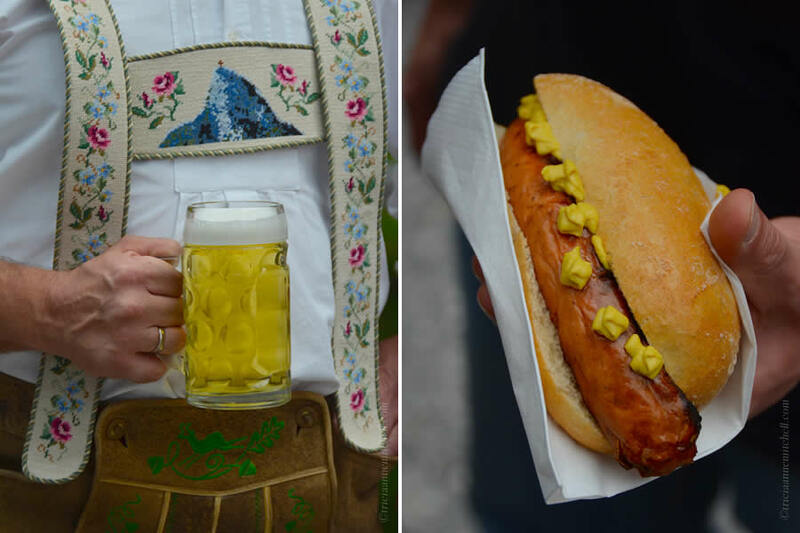 Stands selling beer, Bratwurst, and tempting slices of homemade cakes. In environmentally-friendly Germany, it’s common at festivals to use glass mugs and sometimes even non-disposable dishes. The items are then simply washed on-site. Recycling is also mandatory. Dogs are beloved in Germany, and are welcome in restaurants and shops, but generally not in stores selling food. Here, a furry friend relaxes in a comfortable spot away from all the action. 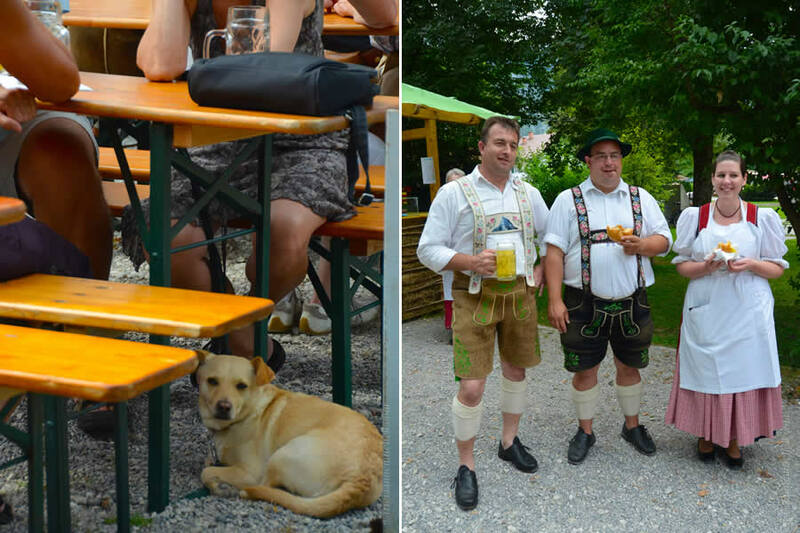 On the right, a trio of locals dressed in Tracht. Traditional fest food and attire. This man’s suspenders were hand-needlepointed by his wife. The mountain depicted in the center is Oberammergau’s signature peak, the Kofel, which we climbed in 2013. 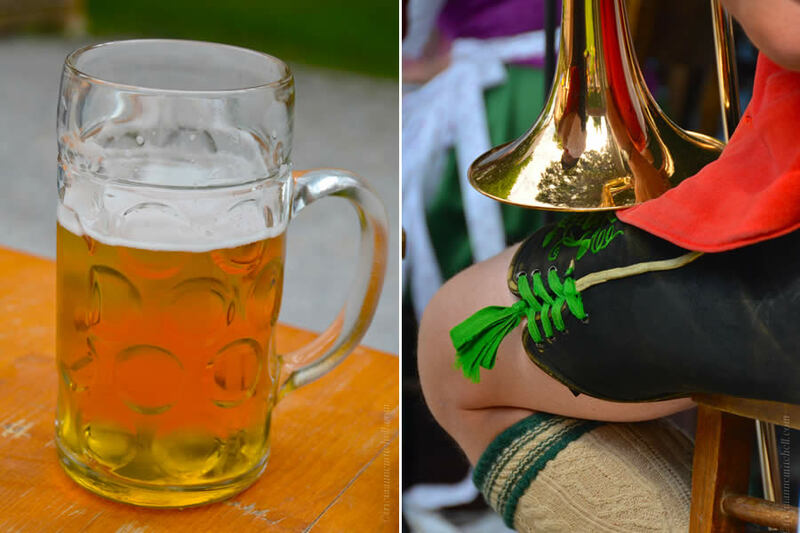 Even members of the brass band have glass mugs of Bier at the ready. Real red carnations adorn the Mieder of a female dancer’s folk costume. 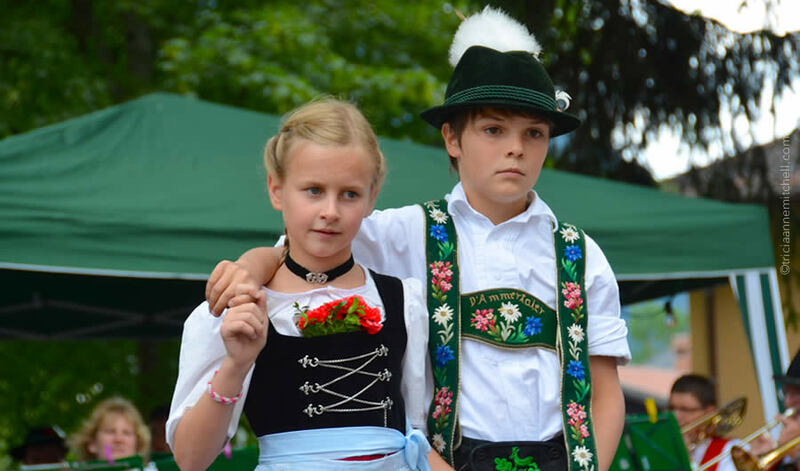 (The Mieder is the part of the costume that is worn over the blouse.) 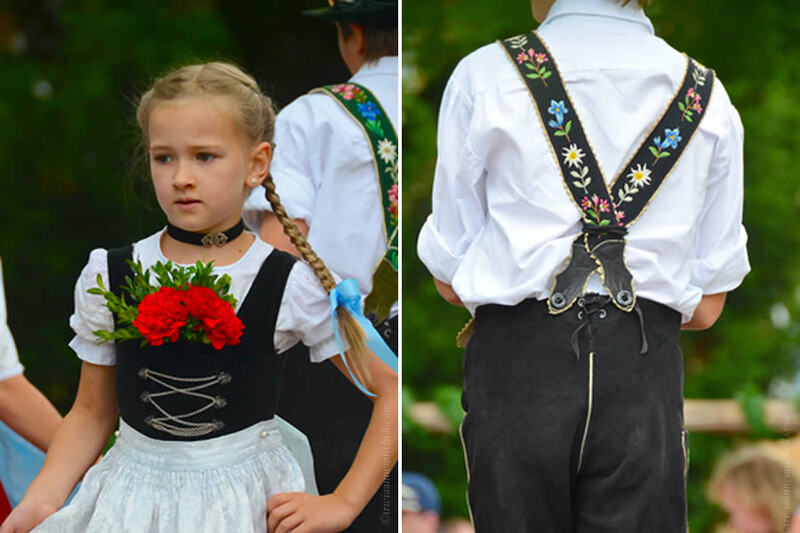 On the right, a boy dancer’s suspenders (Hosenträger) are decorated with Alpine flowers. Dancers sporting white feathers, and a plethora of pins, watch as their peers take to the stage. The children’s instructor stomps his foot to keep the dancers in time. 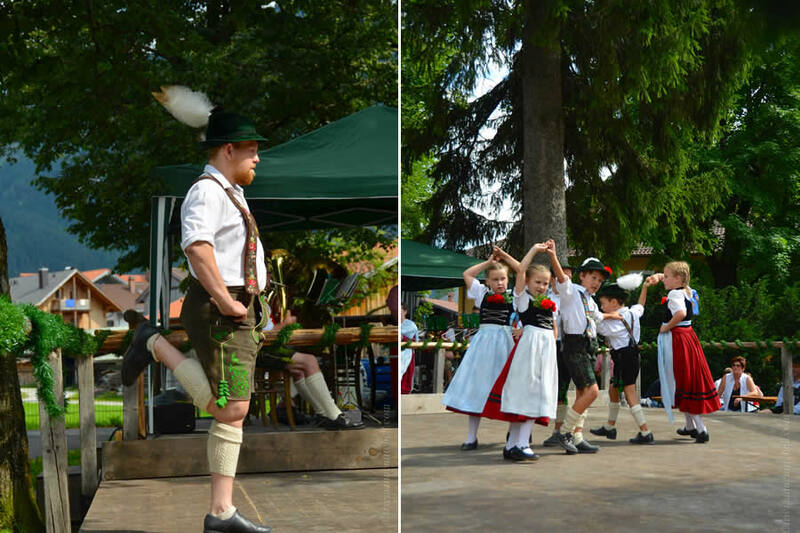 As the fest wore on, dancers of various ages took to the stage. 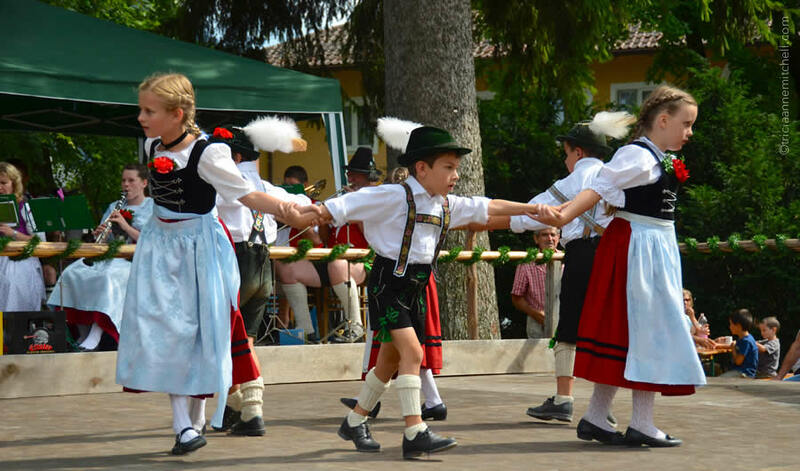 Some performances were all-male, evoking images of the knee-slapping dance scene in a fictional German village in the 1985 film, European Vacation. 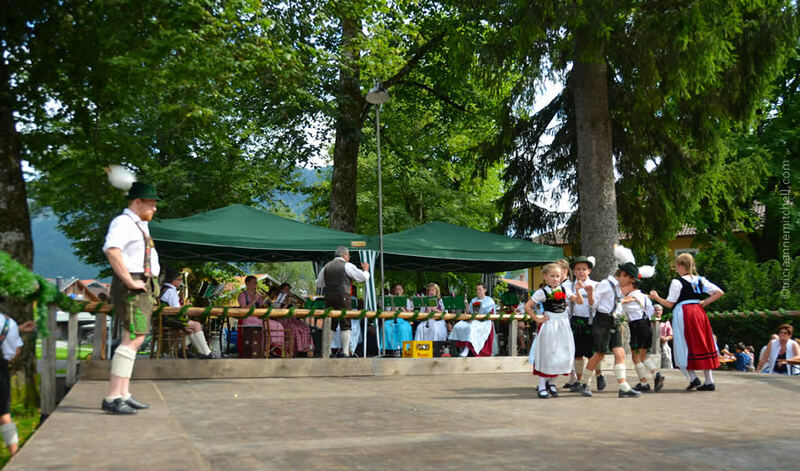 The Gartenfest festival is typically held in Oberammergau in June, but there are several special events throughout the year. 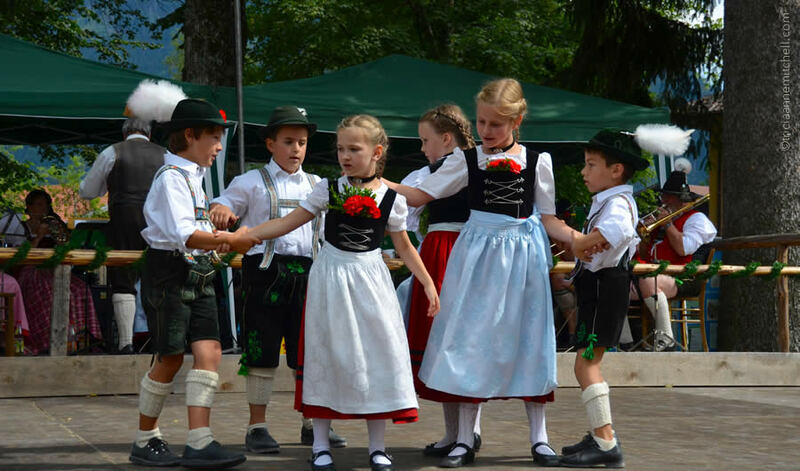 For the current year’s schedule, refer to the Oberammergau Folk / Costume Club (Volkstrachtenverein d’Ammertaler e.V. Oberammergau) website or the Ammergauer Alpen site. 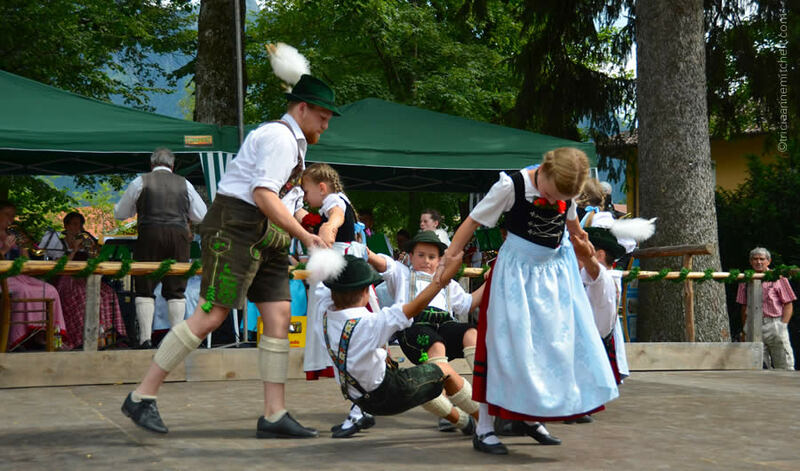 To get to Oberammergau via the German rail or by bus, consider getting the Bayern or Regio Ticket (website in German, but you can use Google Translate). These special tickets start at €20/25 for one passenger, and cost €6 for each additional passenger. You can use them to travel via bus and train throughout much of the region, making them a better deal if you want to make a few stops in a day. You can purchase tickets online, via a ticket machine, or in person. Need more inspiration as you plan your travels through Germany? This link contains a guide and index of all my posts from Germany. I love these pictures, so lively and colourful. The Schuhplattler has always fascinated me. What a fun tradition. Oh yes, we are a large German Canadian family. I first saw this performed however at an Austrian Canadian Club event and loved it. I have included it in my next children’s book, Amanda on the Danube. Darlene, it’s fun that you have cultural clubs like that nearby. When do you expect the latest in the Amanda series to go to print? Greetings, Laura – so much love with which to start the day! :) Whenever I see elaborate costumes or vintage apparel, I can’t help but think of you, my friend. Have a beautiful weekend! My dear Tricia! 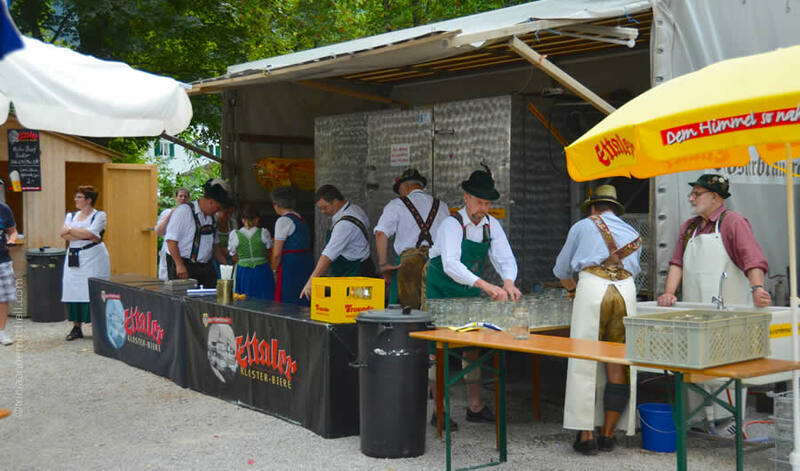 We have some traditional Feasts in our “oldest” canton (Uri – Schwyz – Unterwalden e Nidwalden) but these aren’t so joyful as this one you share with us. It really seams a lot of fun for the youngest and the older ones! Here we’re all in good mood, guess who is right now lying on top of the key-boards? Eh eh eh… he’s gorgeous, a very handsome little mischief. He integrated in a fantastic way and got the prize: he sleeps between me and Massimo. The others had to “make space” but without wars. Shawn and I love seeing the photos of Cocoa that Sara Luna regularly sends us. Indeed, he looks handsome and very healthy – what a shiny coat of hair! And, he is apparently also quite confident. We are pleased that he is surrounded by so much love. You’ve transformed the little kitten into a prince. Hugs to you, and hope to meet again sometime soon! Hi again Susan, it’s nice to hear that the set of images came at the right time. :) I do remember you mentioning that you’ve been to O’gau’s Passion Play several times; any thoughts of returning in 2020 – or perhaps sooner for another visit? We were in O’gau in September of 2013—-a very short visit. I always plan on getting back there. I want to go the the German Christmas markets and there is one travel company that stays in O’gau—-perfect!!! Maybe this year? Ah, as you know Christmas Market season is a splendid time to visit Germany – so long as you bundle up! A mug of Glühwein is also a handy tool. :) If you come to O’gau, perhaps we’ll be visiting at the same time. It would be fun to hear your stories about life there in past years. 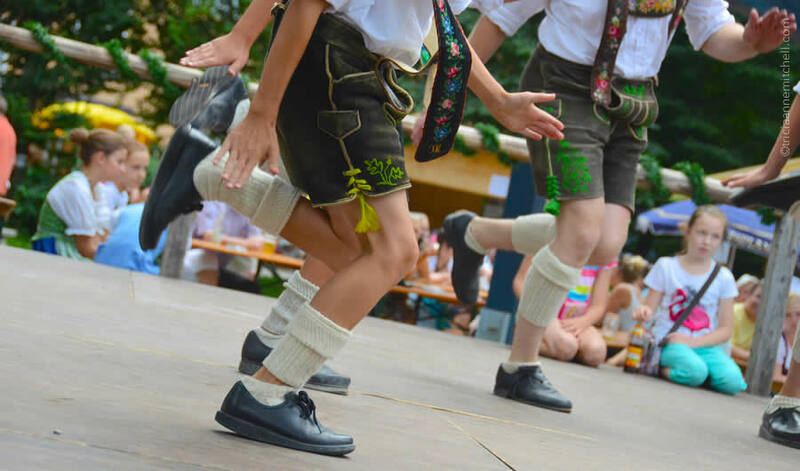 I’ve never seen Schuhplattler myself, but as I scrolled through your photos I could almost feel the music beat! For a country as modern as Germany to be able to keep this kind of culture alive is truly commendable — something other places and countries should also be doing. Bama, you’ve made an interesting point about countries often losing bits of their culture as they advance; thank you for that! 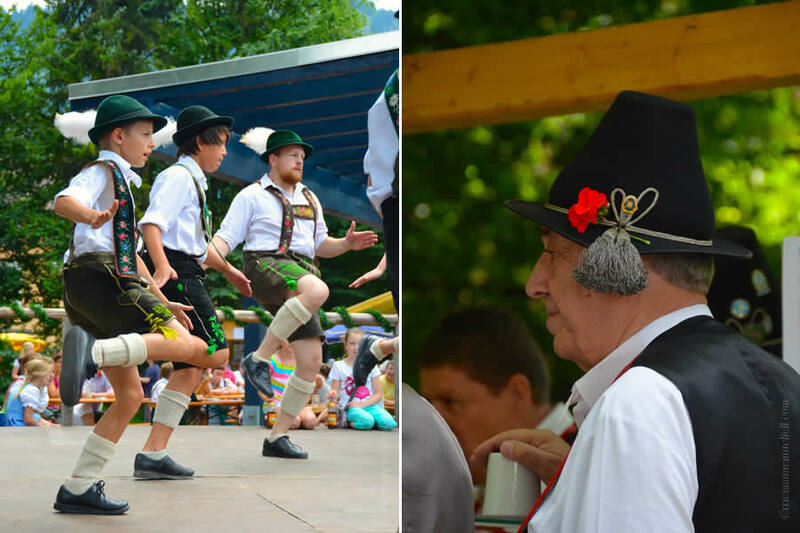 Bavaria is definitely one of Germany’s more traditional states, but even in another German state in which I previously lived, I was impressed by the different traditions they followed there too. The events and traditional practices made for a nice sense of community. Mag, it does bring to mind our weekend trip that had us criss-crossing through Bavaria. Remember stopping at Neuschwanstein, the Ulm Cathedral, and Einstein’s memorial? Lovely memories indeed. Sending a hug your way too! Wow! That was very interesting. I just learned something. Your pictures are beautiful! Hi Gerard, I’m happy that you enjoyed the dispatch from Germany. As you can see from the pictures, the clothes are so vivid, with many details, that they were quite fun to photograph. How has your winter been so far? I’ve heard that the Northeast has been getting a bit of snow! The first month of winter was good because there was no significant snowfall. However, since then, there’s bad weather and drama every week. I’m longing for spring. Gerard, oh no! Sorry to hear the bad weather has been causing unwanted drama. Here’s to blue skies and warmth coming your way soon. Thank you Tricia for your wishes. What a really lovely post, Tricia, makes me a bit homesick. You have captured the spirit of this event so very well, so authentic and real. Altough you are in CA, but too far away so we could meet. Enjoy our time up there. Cornelia, that’s high praise coming from a talented photographer and cultural expert such as yourself. :) Thank you. Regarding a possible meet-up in CA, I’ll keep you posted as to our whereabouts in the coming weeks! We’re now in NV, following a wonderful time in California last weekend. Wishing you a pleasant start to the new week. Oh, what fun! It’s good to see young children learning the traditional dances. 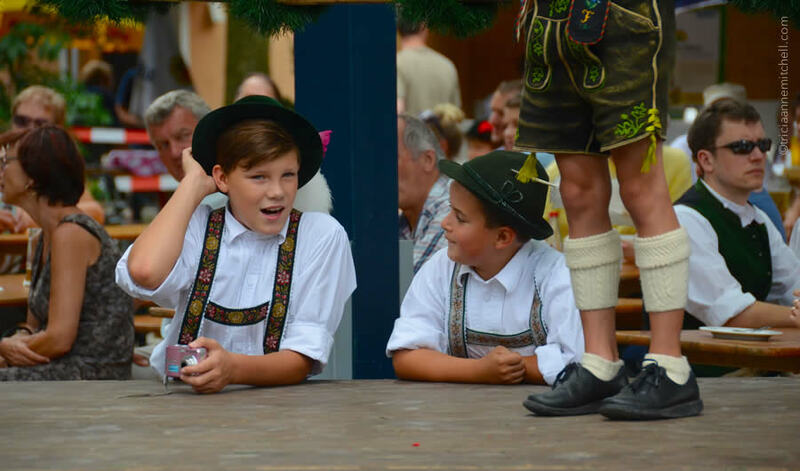 I remember my brothers wearing Lederhosen when they were young. They were indestructible! And even though we weren’t in Bavaria, I had a little dirndl dress. Annette, “indestructible” Lederhosen – how funny. :) Seeing how well-made some of them are in the shops, I can imagine how they held up through much much mischief and play! Do you still have your dress as a memento from your childhood? 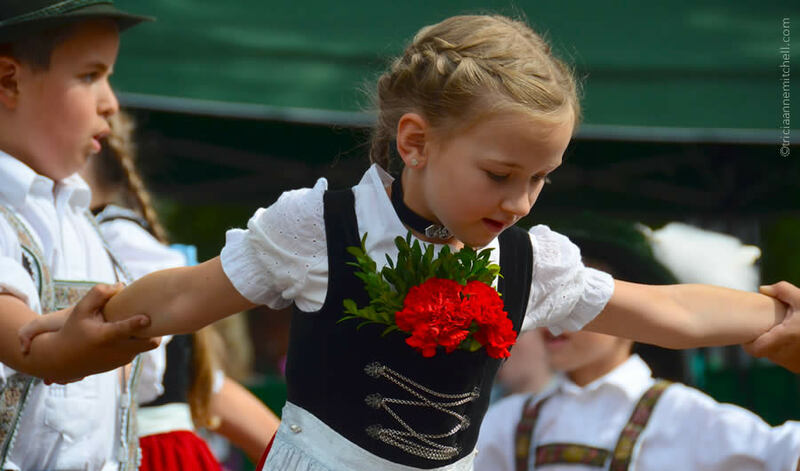 Though I too lived outside of Bavaria as a baby (near Hanau), I had red Lederhosen, and a cheery-yellow Dirndl. My parents still have them today. Yes, and the only way to get rid of your old lederhosen was to outgrow them, but then you probably inherited your older brother’s or cousin’s. Post-war years were extremely frugal. How delightful to see these young people keeping their traditions alive and having a wonderful time while doing so. I loved seeing the ladies wearing their beautiful dirndls. They are so pretty. What a lovely post, Tricia. 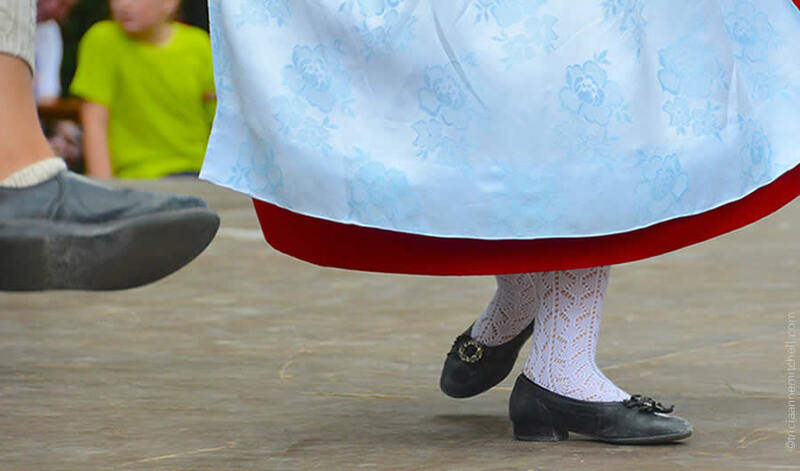 Having lived 30 years in the North Carolina mountains, we took part in many folk festivals with Appalachian dancing and clogging. There was some serious competition among all age groups but the costumes weren’t as appealing as these. Hope you are enjoying your time in the states. Hi Lynne, elaborate costumes or not, that sounds like fun, and a nice way to foster a sense of community! Did you, Ron, and your children all participate in the Appalachian dancing and clogging? When we were in Bulgaria last summer, we enjoyed seeing the locals partake in weekly dance practice. The village was so tiny, so this was one of the main happenings. Lots of smiles and laughter there, and dancers of all ages participating. Hi Tricia, great post! Makes me miss Germany. I had a pair of lederhosen when I was a child too! I remember my uncle carrying me on his shoulders through the Oktoberfest. Has it been a snowy one in Colorado this year? We had lots of snow (about 1 meter) in Germany around Christmastime, but we’re now in a bit warmer climes (the high desert of Nevada). It’s beautiful to see those snowy mountaintops from afar. Randall, “There is magic in tradition,” I like that. Such events do make the past come alive, and perhaps that’s part of what makes them alluring? 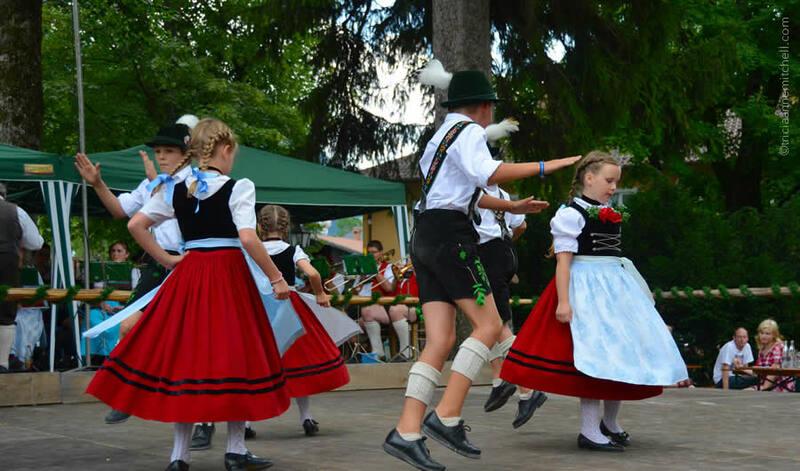 Since I do have some German roots, it is fun being a part of activities in Bavaria and beyond. I’d also like to explore more of my Norwegian, French, Lithuanian, English, and Austrian ancestry. Have you dabbled in any genealogy abroad? Glad to hear you enjoyed Munich, despite it being a bit frosty. As it turns out, we were on the other side of the world (in the States) otherwise Shawn and I would’ve enjoyed meeting up. Very true, it is fun becoming apart of the past where our ancestors made a live. I have checked out my mainly UK ancestry, fascinated by how the Scottish, Irish, Welsh and English blood all came together… :-) The bit of French remains pretty much a mystery though! Wish you a great weekend…it would have been great meeting up in Munich. Cold, but such a beautiful city. Cheers! It sounds like you’re also a bit of a “European mutt.” :) I was lucky because a genealogist wrote a book about the French branch of my family a few decades ago. When I lived in Germany, not far from the French border, I loved taking day trips to the villages where my French ancestors lived in the 1600s. Here’s hoping your French mystery might someday soon be solved too, Randall! Glad to see beer and hot dogs were involved, great post. Mark, that’s a universally-appreciated combo, it seems. :) Thank you for reading – and happy weekend! Nice post. PRety much the same kind of things Im looking and documenting in Asia. MAy should I think about visiting Europe again ? Asier el nomada, as a fellow observer of culture, thank you for dropping by. I’ve been fortunate to visit Asia a few times, but haven’t been in that corner of the world since 2012. My husband and I do find ourselves missing the warm smiles of the friends that we met along the way, the spicy-hot food, and the chance to witness different cultures in action. Inviting beaches and lanes rimmed by palm trees also sound pretty nice as we make our way through winter. :) Have you made it to Germany yet? Not actually. I think Im centering in Asia. Docmenting and amazing myself for long. I have here asia for a time hehe. Never been in germany. I do have to travel in europe, but prices are so high! Peoples hospitality is not the same, you cant camp and travel freely everywhere… Its another kind of travel that i do not enjoy as much as I do in Asia. Hi Asier, it’s true that travel in some European countries can be much more expensive than in other parts of the world. (We had a bit of ‘sticker shock’ after spending 5 months in Southeast Asia and India and then returned to Germany.) With that being said, we’re fortunate that my parents live in Germany, and that we’ve also been able to travel in Europe during the low season, when empty hotel rooms and apartments lead to prices being more reasonable. We’ve also found it rewarding going to lesser-visited, but very enjoyable parts of Europe, such as Moldova and Albania, where less tourists meant that the locals were eager to chat. Such interaction was one of our favorite parts of our visits. Wish you continued enjoyable travels!